This recipe was originally going to be posted before Passover. I made them a couple of weeks prior to the Holiday, and was going to post them as a great way to use up a package of Oreos that you might find in your cabinet. Then they didn’t get posted. Mostly because I was already on to Passover recipes. I have to say, if there’s one great way to celebrate the ability to bake again (after Passover) this has got to be it. Not only does the recipe use flour, but it used oreos too- a totally non-Passover ingredient. If you are on the lookout for a great recipe to get you started after Pesach, or if you (like me!) think that all foods can be improved with the addition of Oreos, or you simply have half a package that you don’t know what to do with, make these. If you are non-of-the-above…make these. No jokes. Whoever you are, make these. Everyone who tasted them loved them, asked for more. 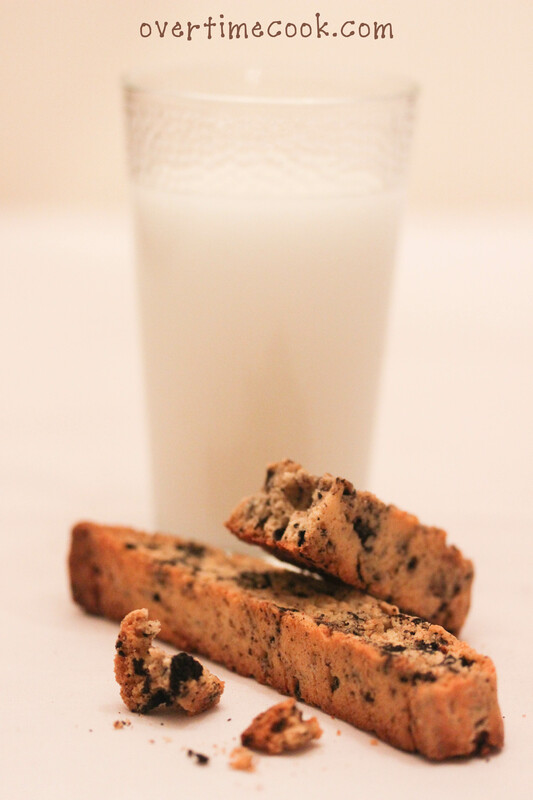 Plus (more importantly, I think) these being biscotti means they’re a whole lot easier to make than some other cookies. Really, do you need more convincing? Preheat oven to 350. Line a baking sheet with parchment paper. Set aside. In the bowl of an electric mixer, cream together the sugar and butter/margarine. Add the eggs and vanilla extract and beat until smooth. In a separate bowl, whisk together the flour, baking powder and salt. Stir into mixer bowl. Fold in the chopped oreos. Divide the mixture in half. With floured hands, shape each half (on the cookie sheet) into a loaf, approximately 9×3 inches. Bake at 350 for 30-35 minutes until golden brown on top and a toothpick inserted into the center comes out clean. Cool loaves for 10 minutes. Slice diagonally into 1/2 inch slices and return to baking sheet. Bake for an additional 10 minutes per side until lightly toasted. can I sub the margarine for oil? I haven’t tried it with oil, but it only uses a bit, so I would imagine it would work well. Please let me know how it turns out if you try it! Those look really great, a sort of cookie/biscotti fusion. I’ve never even cooked with oreos – I must! Though I’m not sure they’d improve my curries. Great use of Oreos! 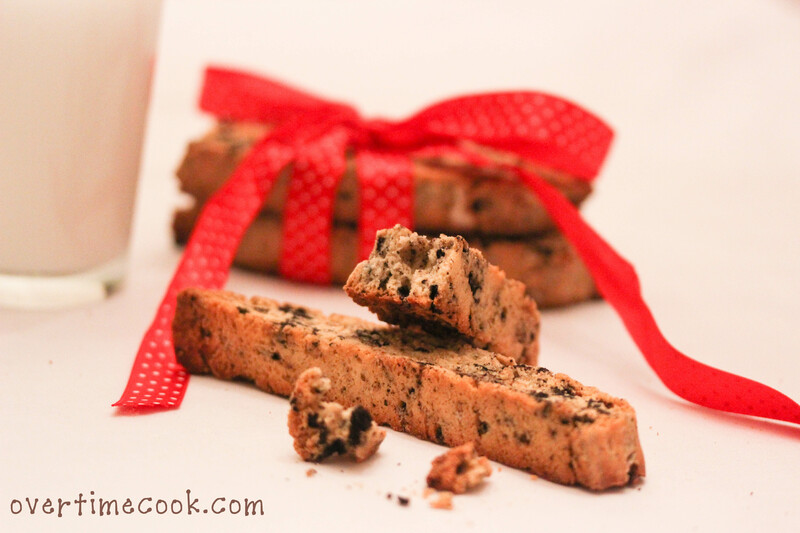 Lovely looking biscotti. Wow this looks really good!! I would love if you would share this and any other posts at Showcase Your Talent Thursday http://whatscookinglove.blogspot.com/2012/04/showcase-your-talent-thursday-3.html. I hope to see you there! I’m totally obsessed!! just took them out of the oven…mmmmhhhhmmm!!! 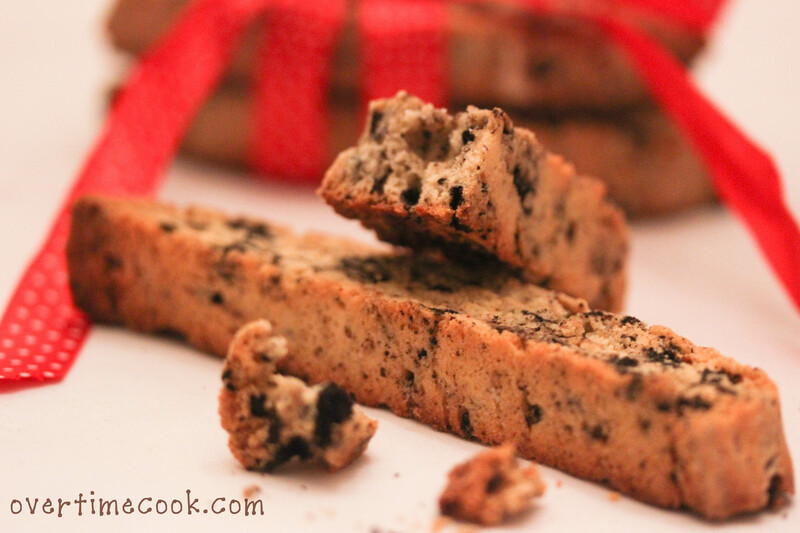 Biscotti is the best thing for Shabbos Kiddush and these look great! Can’t wait to try them! Thanx for another great recipe! So, I’m making these again for another event tomorrow night! They always go so quickly 🙂 Thank you Miriam!